Hispanic Studies Review (HSR) is pleased to announce its inaugural issue: Vol. 1, No. 1 (2016). HSR is an international refereed journal published twice a year by the Department of Hispanic Studies at the College of Charleston. The journal welcomes submissions on cultural studies, applied and theoretical linguistics, and the literatures of the Spanish-speaking worlds and their contact zones. HSR particularly invites scholarship with approaches that are interdisciplinary and/or that engage innovative dialogues. Articles may be written in Spanish or English. HSR only accepts electronic submissions at [hsr@cofc.edu] and each manuscript will undergo a rigorous double-blind peer review. 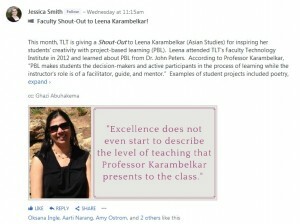 TLT "Shout-Out" to Professor Karambelkar! We’re so proud to share the exciting “Shout-Out” that TLT gave to Professor Leena Karambelkar on November 2nd. TLT gave the “Shout-Out” to Professor Karambelkar for inspiring her students’ creativity with problem-based learning (PBL). She attended TLT’s Faculty Technology Institute in 2012 and learned about PBL from D. John Peters. According to Professor Karambelkar, “PBL makes students the decision-makers and active participants in the process of learning while the instructor’s role is of a facilitator, guide, and mentor.” Examples of student projects included poetry, teaching materials about Indian scientists, and a book written in Hindi for young girls.